First published, March 16, 2011. Reproduced for archival purposes only. I am enjoying several books at once. I just finished reading EC Osondu’s Voice of America. The title story alone is worth the price of the book. Osondu uses crisp language, shorn of gimmicky frills to tell engaging, funny stories. The stories spoke to me personally, and took me to an era I am intimately familiar with. Osondu wrote about the past and it seemed like it was here. Uche Nduka has just released a new volume of poetry with the enigmatic title eel on reef. I adore Nduka, I believe he is one of Africa’s most important poets, he writes with care, erudition, vision and affection, every word in place, almost fastidious, but still bold. Find that book and devour every luscious word, this is how to write poetry. The journal AGNI (72) has a portfolio of African Fiction edited by EC Osondu and William Pierce. Some of Africa’s best writers are assembled under that canopy, having a good time with their muses and demons. I read The Treasonable Parrot by Ogaga Ifowodo. It is pretty good, with an edgy hilarity. Victor Ekpuk has some art pieces in there nicely breaking up the monotony of text. There is a harrowing piece in there by Chuma Nwokolo (Sentencing for Six). If you don’t know Nwokolo, please run, don’t walk to http://www.African-writing.com, he is addictive. Victor Ehikhamenor is up there cracking ribs with his patented njakiri. I shall be reading Igoni Barrett’s piece next. Barrett is darkly brilliant, enigmatic and eclectic, one of the younger literary Turks to watch. Oh, please go to AGNI online and read Akin Adesokan’s affecting short story Knocking Tommy’s Hustle. I am officially in love. 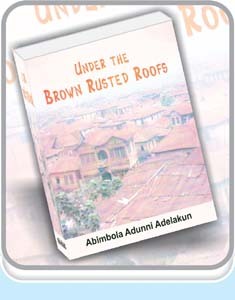 With Abimbola Adunni Adelakun’s book, Under the Brown Rusted Roofs. They say never judge a book by its cover. When I first got the book I took one look at it, spied some typos in the first few pages and tossed it into a corner of my bedroom where books that I don’t care for go to die. This is one poorly produced book, the editor and the publisher should not be allowed to touch another manuscript again, ever. I only went back to the book after reading an interview in which Professor Niyi Osundare gushed over the book. I see now why Osundare loves this book. Adelakun studied Yoruba customs, folklore and mythology, apparently not in a classroom, but on the tough gritty streets of Yorubaland. There are strong shades of Ola Rotimi’s intimacy and proficiency with Yoruba folklore. And the dialogue is straight from the street’s pots, no pretense. I am going to start a campaign to find a good editor and a real publisher that will take this book and Adelakun to the heights that they deserve. Hear Adelakun: “Afusa never went to school, but always taught her children their homework. She taught her first son the alphabet by gazing into his alphabet book for long and mastering the letters… Afusa was worn out with the stress she had gone through in the day but while she waited for the herbs to boil , she made her son, Sikiru, who had just started school, read the alphabet. ‘A for APPLE,’ the boy read. ‘Hen-en. Go to the next one.’ The boy paused and asked her what an apple was. ‘Why didn’t you ask your teachers?’ The boy shrugged. ‘See. It is the thing they drew on the page. Look at it. It is round like a ball.’” A for Apple! Oh Nigeria, what have you done? This book makes me sad, but I am deeply in love with it. I am reading Chukwuemeka Ike’s The Potter’s Wheel again. Ike is one of Africa’s most unsung writers. Hear him describing a nine-year old spell a jawbreaker: “Obu spelt his name slowly and correctly. The teacher was satisfied. ‘Now, we shall see.’ He switched over to English. ‘Spell me em – em – tintinnabulation.’ The whole class shouted as the jaw breaker rolled out of the teacher’s mouth like bombs from the hatch of a bomber. No one in the class had heard a word so bombastic before. Obu rolled his big head from one side to the other and accepted the challenge. ‘We shall see’ was at the blackboard with a piece of chalk waiting to write the letters down as Obu spelt them. ‘T…i…n…’ The teacher wrote the letters down. ‘t …i… n … n …’ Obu bit his lips, held his chin with his left hand, looked at the seven letters on the board and saw the rest of the word dearly in his mind’s eye: ‘a…b…u…1…a… t… i…o…n’ The teacher dropped the chalk without writing the last letter on the board, and rushed to shake the small hand of his new-found genius. ‘Wonderful Terrifious! Marvellous! We shall see this year.’ Obu was the kind of boy every teacher wanted in his class – young, full of brain rather than brawn, the type who was destined to enter Government College, Umuahia if it reopened after the war.” Read what you enjoy. Toss the rest. Life is short. Indeed, Life is too short to be caught in ‘bad reads’. Oh the things books do to me, everytime…it’s like venturing into wonderland and happily getting lost while wishing the adventure would never end!